There appear to be 2 different anomalies relating to temperature/density variation that have been observed after detailed analysis of the Planck mission results. There is much debate as to whether the anomalies are statistically significant, with many cosmologists dismissing them outright. ESA, however, who conducted the Planck mission, is not in the dismissive camp, claiming that they are indeed statistically significant and cannot be ignored. Many of the cosmologists in the dismissive camp point out that ESA takes this stance because it is in their vested interest to do so, interestingly, the same argument that climate change deniers mount against NOAA. But what exactly is it that is anomalous. Firstly, looking outwards from our position in the universe, one hemisphere appears to have a slightly higher temperature when compared to the opposite hemisphere. If correct, this indicates that the density of the universe is slightly higher viewed in one direction as compared to the opposite direction. Secondly, the local variations between highs and lows are slightly more pronounced in one hemisphere than in the other. This may indicate that the perturbations in density, that are known to increase with time, are more advanced time-wise on one side of our universe and less advanced on the other. With the previous mission to measure microwave background radiation (WMAP) the anomalies could be dismissed as statistically insignificant. The argument used was comparable to say measuring the size of sand grains on a beach. If you could continue to get more accurate measurements of the location and mass of each and every grain of sand on a particular beach, you would eventually be able to show that one half of the beach had on average slightly larger grains than the other half. The anomalies in the microwave background radiation variances, they argued, were not really anomalies and simply were a result of an incredible increase in resolution. Reasonable argument it may seem. However, by dismissing the statistics indicating larger grains of sand at one end of a beach, you would fail to discover that this phenomena is indeed an indication of prevailing winds and waves along the shore of a beach of finite length. If indeed statistically representative, either one of the hemispheric temperature anomalies identified by the Planck mission would undermine both of the pillars of the Cosmological Principle, isotropism and homogeneity. The diagram above is ESA's '360°' summary of the anomalies. Although these anomalies, when first noticed in the WMAP data, could be dismissed simply as background noise, ESA insists this is not the case with the enhanced resolution of the Planck mission. [ESA Website Ref] So what could these anomalies imply? It would appear, at the very minimum, that the possibility of an anisotropic and inhomogeneous universe can no longer be ruled out. However, to entertain such a notion would require reworking our current flat model of the universe. If the data indeed withstands the scrutiny of time, proponents of a positively-curved finite universe may very well have a legitimate argument for such a model. If the anomaly indicating that one hemisphere is warmer is accurate, then the structure of our universe may turn out to have a region with sufficient density to affect the balance of the universe on a larger scale than previously thought. 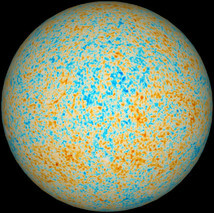 With respect to the anomaly that indicates a hemispheric bias in terms of one hemisphere having more extreme density variations than the other, it could be argued that, in a positively-curved universe, an observer might be seeing slightly different ages of the universe dependent on what part of the universe is being observed. Density variations would increase with time, and in this sense, the signals showing more variation could be slightly older than those with the 'smoother' profile. Click on Planck image below to link to interactive model by Damien P. George. He uses the raw data from Planck/ESA which is essentially 3d data in Healpix format. The mapping of the Healpix coordinates to texture maps on triangles is not completely accurate (but it is close), hence there are minor distortions at the poles of the model (see if you can find them).